Compared to many of the other states of the union, the State of Florida may appear to be a fairly recently settled state. Yet, the history of this peninsula goes back to the oldest city in all of the United States, that of St. Augustine in the northeast corner of the region. It has been a colony of the Spanish, English, French and a territory of the United States. Settlement for decades remained primarily in the northern half of the state. Not until the 1910s and 1920s with the land boom of the central and southern portion brought more people to the sections that was still considered ‘frontier property’ did the country start to take notice of this state. In the 19th century, after the American Civil War, many families resettled from neighboring Georgia, the Carolinas and Alabama to the upper portions of Florida. This might a section of your family tree you have overlooked, those ancestors who did not move the far west but rather south into Florida. The Florida State Library and Archives of Florida have set up ‘Florida Memory’ site online for anyone to use. There are many artifacts, documents and items of interest in their collections, but one not to be overlooked is the massive photographic collection. With over 170,000 images running from daguerreotypes, to tintypes, glass negatives, stereoviews, 35 mm film and digital, the range and variety of subjects is massive. If you wanted to view just the collection of Florida daguerreotypes which can date back to the 1830s, that keyword could be placed in the search engine to produce a thumbnail image and brief description. If you found one of interest, just click on the smaller image to view a much larger version. Scroll down and then whatever available information on the image would be presented. The Florida Memory site has also made it easy to order a copy of any of the images in the collection with full instructions in the ‘ordering information‘ tab. If there was a certain time period you wished to view of photos, just place the individual date or range of years; such as ‘1900 to 1910‘. Other key words to search would be surnames. Putting in the ‘Wilson’ surname produced some 801 images. If an ancestor lived in a certain location, such as Vero Beach, just place the town’s name and a wide range of images from that location will appear. For Vero Beach there are 250 images covering from homes, the beach, churches, hotels, McKee Jungle Gardens, street scenes, baseball training camps to the county courthouse. The Photo Exhibits sections, listed on the link to the left side, are various photo topics. Of special interest for those researching family members would be the “Images of Florida’s Black History“, “Florida Cattle Ranching”, “Florida Cigar Industry”, “Women of Florida“, “Japanese Immigrants“, “Florida Football”, “Jacksonville Fire of 1901” and “1898 Troops Ready for the Spanish-American War”. Any Florida lineage, if so, investigate what the collection of photos has to offer. 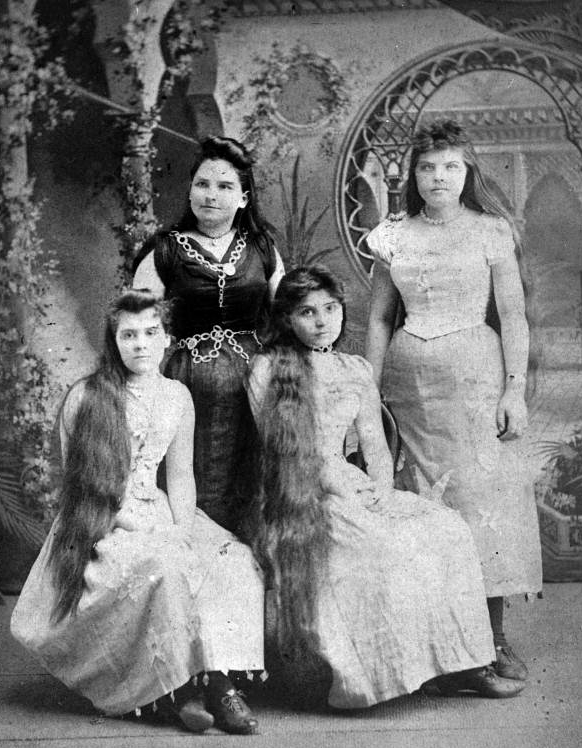 Photo above: The Wilson sisters in the 1880s in Bartow, Florida.